Updated Wednesday September 19, 2018 by Citrus Park Sports Association. As you can all see construction has begun! This is very exciting news, as soon our new field will be available for use! That being said, the side road (Alema Street) that goes to the back field must be closed down. The county will be taking it out today and putting another road back in, however it will take them 2-3 weeks to complete. We understand the inconvenience this causes, for some, and truly appreciate everyone's understanding and support the next couple of weeks. We promise, it will all be worth it to have this new area! Exciting News! 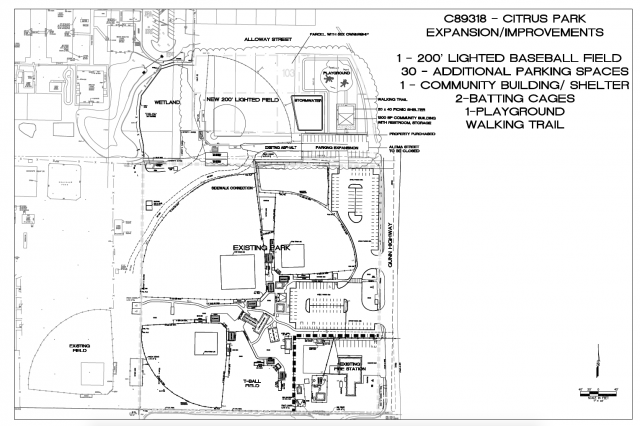 Hillsborough County has approved the expansion for Citrus Park to have a new 200' lighted baseball field with additional batting cages, 30 additional parking spaces, a playground and additional restrooms. Construction should begin in November right after our fall season and anticipated completion is June 2018! A HUGE thanks to all the coaches, volunteers, parents and residents who attended meetings and wrote letters on behalf of CPSA!